"Attorney Danny Sheehan said that in one of two studies that were written at the Library of Congress for reading by President Jimmy Carter, the reports stated there are at least six extraterrestrial races from this galaxy visiting our planet. This was in one of the two official studies by the Library of Congress for the President of the United States." 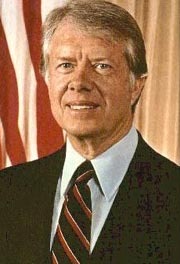 James Earl Carter, Jr., 39th President of the United States, 1977 to 1981.